This date in 1758 marked the hanging of a somewhat more down-market highwayman than we have seen in these parts — the son of a farmer whose scrapes on the lam and gift for evading justice might have served for the day’s gallows-foot mongers, but left little worth posterity’s time. Page applied a bit of ungentlemanly industry to his apprenticed profession, which seem to have profited his longevity at the expense of his legend. [H]e had drawn, from his own observation and for his private use, a most curious map of the roads twenty miles round London, and, driving in a phaeton and pair, was not suspected for a highwayman. 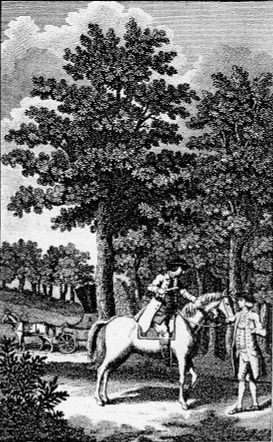 In his excursions for robbery he used to dress in a laced or embroidered frock, and wear his hair tied behind; but when at a distance from London he would turn into some unfrequented place and, having disguised himself in other clothes, with a grizzled or black wig, and saddled one of his horses, he would ride to the main road and commit a robbery. This done, he would hasten back to the carriage, resume his former dress, and drive to town again. Meanwhile, he robbed, gambled it away, made love, was taken by his paramour, revenged himself by more robbery, and so forth. Page’s habit of going about in disguise helped him dodge several capital charges on account of the difficulty of identifying him. But, you know — ever thus with deadbeats (at least in these pages): one finally stuck, and Page expiated his unusual career in the usual way at Maidstone.